Earlier, CBSE had announced that students do not have to pass separately in theory as well as practical exams. In a relief to Class 10 students, the Central Board of Secondary Education has extended the passing criteria. “To give relaxation to students, the board has decided to ease the passing criteria for Class 10 students from 2019,” said CBSE chairman Anita Karwal. From next year, the students need to get a minimum of 33 per cent marks in theory and practical combined to declare pass in the subject. “It has now been decided to extend the same passing criteria henceforth for the students of secondary classes i.e. candidates apprearing for Class 10 examination 2019 onwards will have to secure 33 per cent (both taken together) in the subjects to be eligible to pass the subject,” mentioned the official release. Earlier, CBSE had announced that students do not have to pass separately in theory as well as practical exams. For the year 2019, the board will conduct the Class 10 and 12 examinations from February and has released a list of vocational subjects that will be conducted during that period. 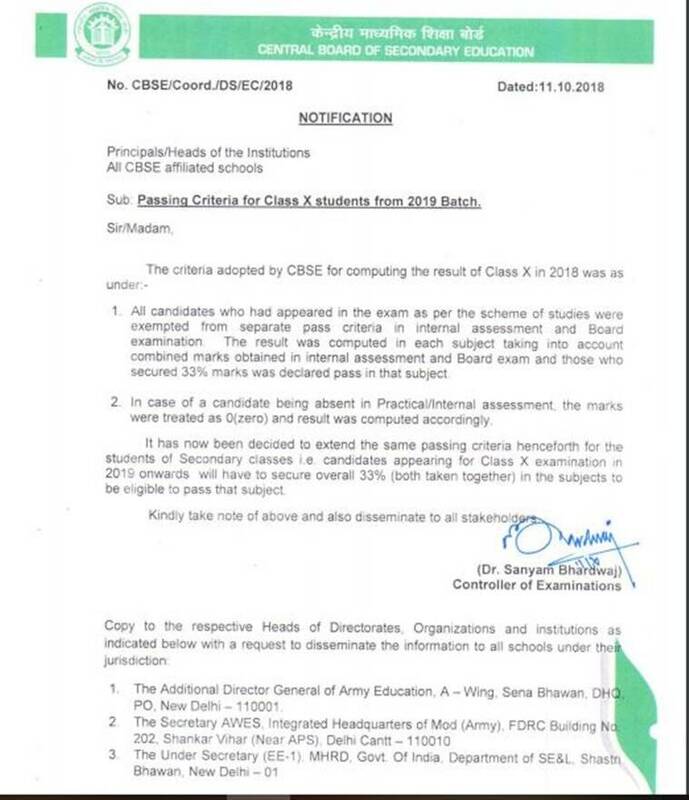 As per the official notification, the board mentioned that it is following the Delhi High Court order that directs Delhi University and CBSE to ensure from the commencing academic year, the result of CBSE, including re-evaluation, is taken into account while determining the cut-off date for admission to colleges of the University of Delhi. Apart from the 40 different vocational subjects, the board will conduct exams for Typography and Computer Applications (English), Web applications, Graphics, Office Communication, etc in February as these subjects have larger practical component, and shorter theory papers.